Machining and holding tight tolerances of exotic materials such as G-10, GPO and Phenolic Laminates can be extremely difficult. With over 50 years of experience, we are experts in machining G10/FR4 and Phenolic Laminates. Laminated Plastics takes the guesswork out of machining these tough materials and delivers you production fabricated parts that are engineered to your drawing specifications. Our advanced processes are proven to save you both money and time while producing products of superior quality and accuracy, for small or large production runs that are custom tailored to your specific needs! 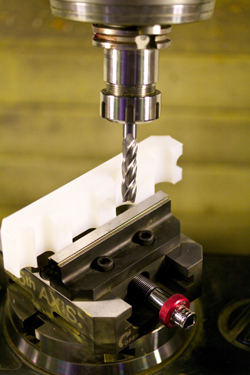 Laminated Plastics use of integrated high speed CNC multi-spindle drilling and routing machines offer a total advantage over limited techniques such as die cutting, stamping, laser, water jet or EDM wire cutting. We produce parts with limitless geometry options not possible with these types of techniques especially when cutting tough materials like G-10, GPO and Phenolic Laminates. Our fast turnaround commitment ensures on-time delivery, every time! 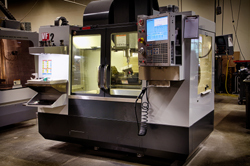 Our fully automated machine shop utilizes CAD/CAM design from prototype to production to produce superior quality and delivery on extreme plastics and phenolic parts. Our AS9100 quality system ensures that you will receive full drawing conformance even when fabricating the Tough Stuff! !